Get Ready for School at A Few Cool Hardware Stores! Check out these awesome Back to School Savings! There are so many ways to use a 5-gallon bucket– aside from it’s obvious utility for painting and transporting materials, these buckets are large, versatile, and useful with just about any DIY project. Here are some of our favorite ways to use these buckets–and don’t forget to stop into Ace July 20th and July 21st for our CMN Bucket Sale– 20% off your entire purchase and a free limited edition bucket when you donate $5 to Children’s Miracle Network! 1. Make Your Own Vegetable Container Garden- 5 Gallon Buckets are the perfect vessel for just about any plant! Without the rounded lip typical of most pots, you can fill these buckets with a few extra inches of soil, giving your plants some extra room to grow. Tomatoes are a favorite to plant in these buckets as they require a lot of room both for their roots and their limbs, though most any plant will flourish in these buckets. And, with a few 1 inch holes in the sides, these buckets can make great strawberry planters! Make sure to drill a few 1/4 inch holes in the bottom of the bucket to allow for drainage. 2. Portable Tool Chest– Most hardware stores (including Ace) sells a toolbelt specifically designed to hang on buckets. If you are a contractor or simply do a lot of work around the house, these tool buckets are a great way to organize your tools but still be able to bring them with you on a ladder, in your car, or just about anywhere! 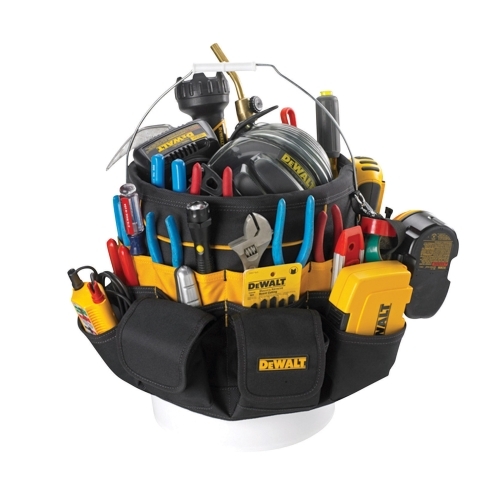 Store your power tools and larger hand tools in the middle, and your accessories and smaller hand tools in the bucket tool holder. 3. 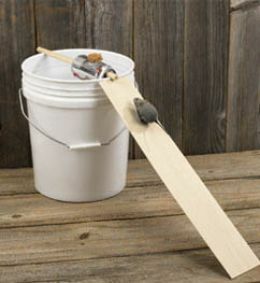 Mouse Trap— As disgusting as this may sound, these buckets make really effective mouse traps. Most of the tools you need to build the trap are likely lying around the house (a tin can, dowels, a scrap of wood and some peanut butter will do the trick! ), and the trap doesn’t need to be reset between mice, making this the perfect trap for a basement or crawl space. It’s not the prettiest thing, but many will swear by this technique! Instructions here. 4. Aquaponics– It may not be the prettiest looking fish farm you’ve seen, but all those lush edible leafy greens will make it worthwhile! Aquaponics is a system that uses fish to fertilize plants. It is a self contained ecosystem, where a basin of live fish produce nutrient rich waste which in turn is absorbed by the plants stationed above the system. All you need to build this system is a few empty plastic bottles and a small pump that you can purchase at most hardware stores. It is a little tricky to explain the system, so here is some information about aquaponics, as well as the instructions to build your own system at home. 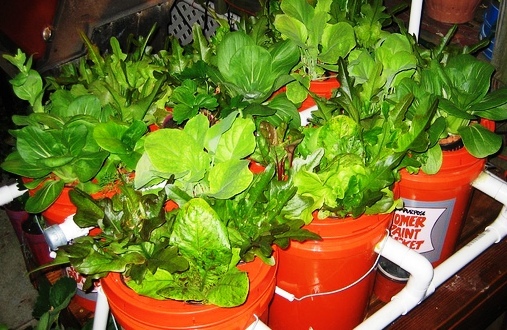 You can’t grow fish large enough to eat in a 5-gallon bucket, but using a large storage tote instead allows you to grow fish as well as produce. 5. 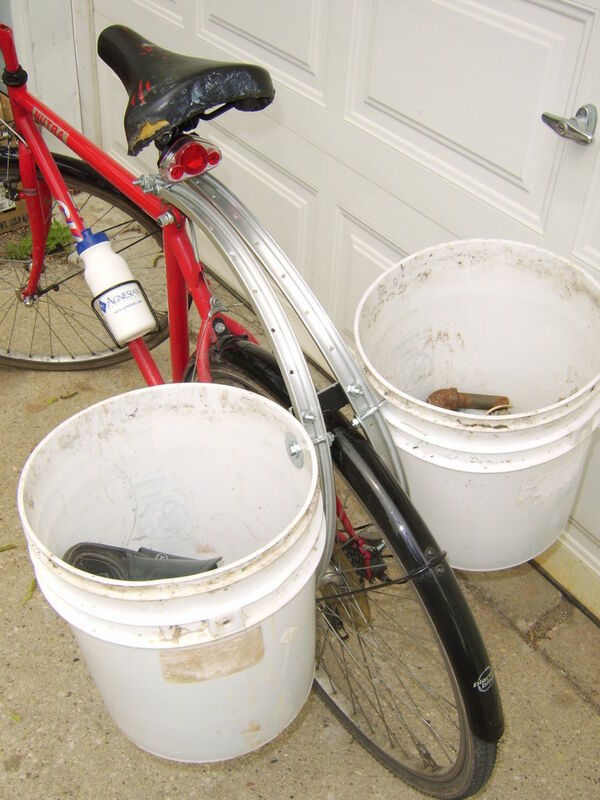 Bike Panniers– A few drill holes and some straps, and you’re bike pannier is ready to go! It can be as simple as you want it to be, but here are some detailed instructions on how to make a long lasting bike pannier– though square buckets are the preferred style, it is easy to adapt the project for a round 5-gallon bucket. Want to redo your bathroom but can’t afford the time or money it takes? Here are some tricks to give your bathroom a facelift on a budget! 1. Go Tall– Replace your busy wallpaper with a calm paint color, and replace those big long mirrors with two taller ones to give the room some extra height. Try trading your short shower curtain for one that is longer to fill the space more effectively. 2. Design over Dollars– Before you knock down any walls to expand your powder room, try having the right accessories and decluttering your floors and countertops. It makes a world of difference in any bathroom, especially those in small apartments! 3. Replace your largest fixture with something more streamline. Sure, it’s great to have those gigantic countertops, but a freestanding sink saves you space and makes your bathroom more functional. Next time you are near your neighborhood scratch and dent store, stop in and look around for something simple, clean, and unique. Announcing MADE in DC – In order to spotlight products made in the communities where our stores are, we are seeking local entrepreneurs who are ready and able to sell their DC made products on a larger scale. If you are interested in being a part of our first round of new vendors, please download and review the following document and send any questions to info@acehardwaredc.com. : Made in DC program overview (1). Can’t wait to hear from you!